A holiday ... not a training camp - apparently? | theraceforthecafe.com . A holiday ... not a training camp - apparently? Last week I was riding my bike in the sun in one of my favourite places. 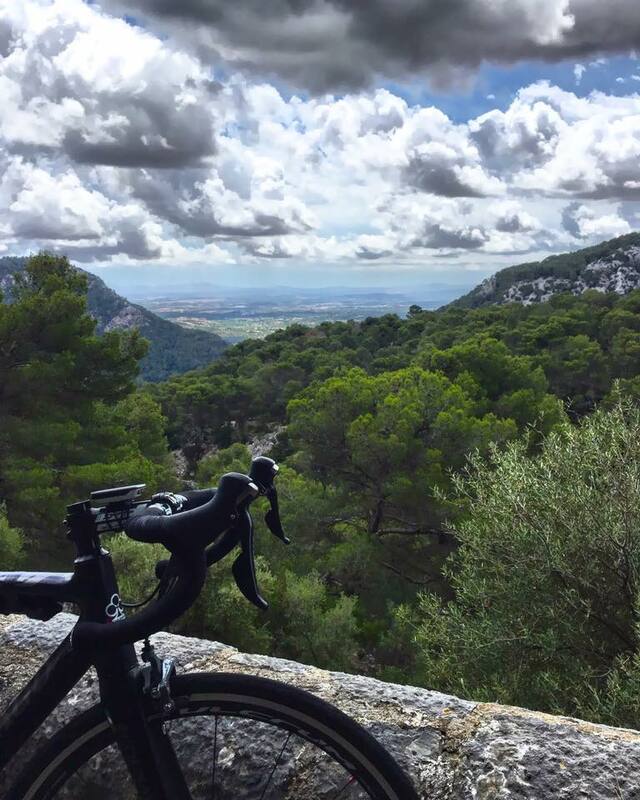 Majorca (or Mallorca if you prefer) is as many blog readers will know is a fantastic cycling destination. We first visited the island in 1990 and we have been back almost every year since. 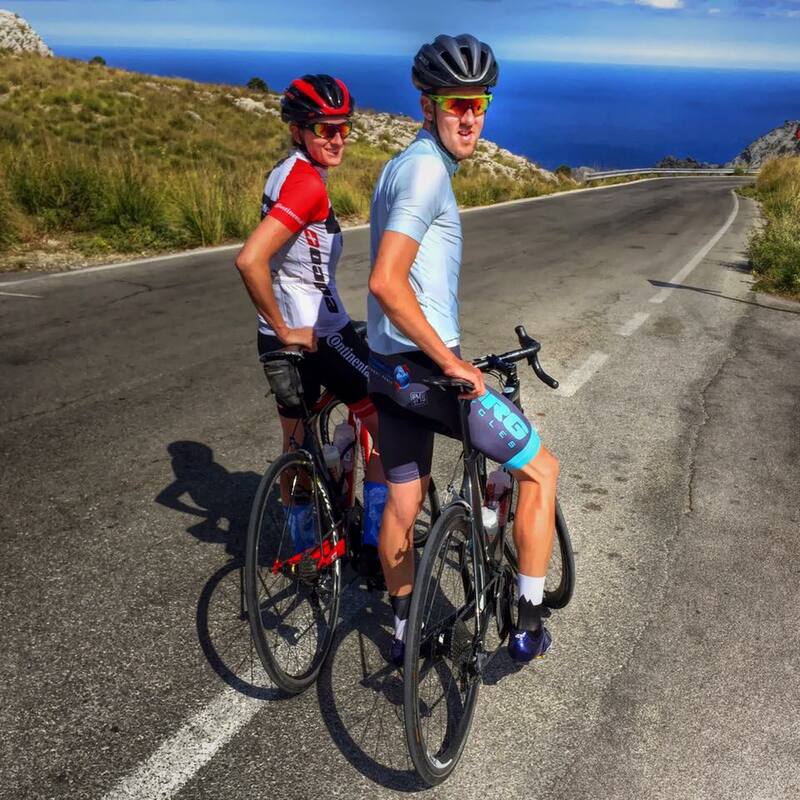 Our favourite resort in Majorca is Puerto Pollensa, one of those rare places that I would have no hesitation recomending to anyone (providing a wild nightlife isn't what you are looking for) but as a family orientated cycling resort Pollensa and the nearby Tramuntana mountains are hard to beat. 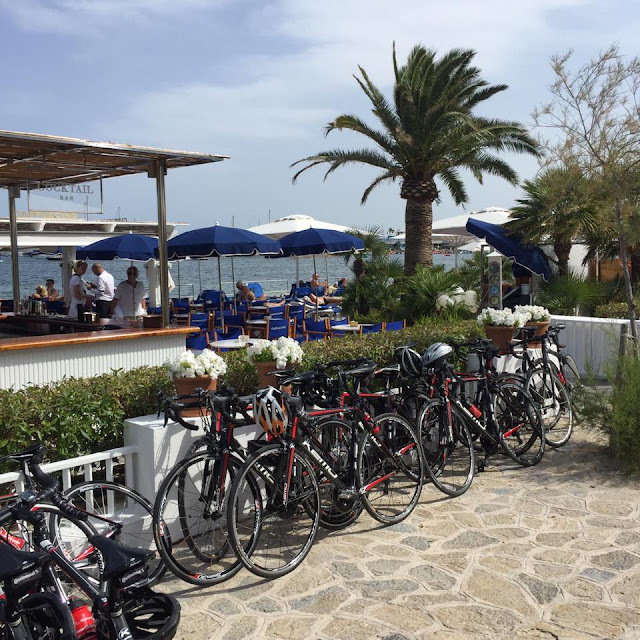 The peak cycling months in Majorca are earlier in the year but even in June there are still loads of cyclists on the island from all over Europe. This year the temperatures in June have been a lot higher than normal and during our week it was 30+ every day. Getting out reasonably early was the plan. I hired a Colnago CX Evo with Ultegra group set from Pro Cycle Hire in Pollensa (25 Euros per day) - Procyclehire. 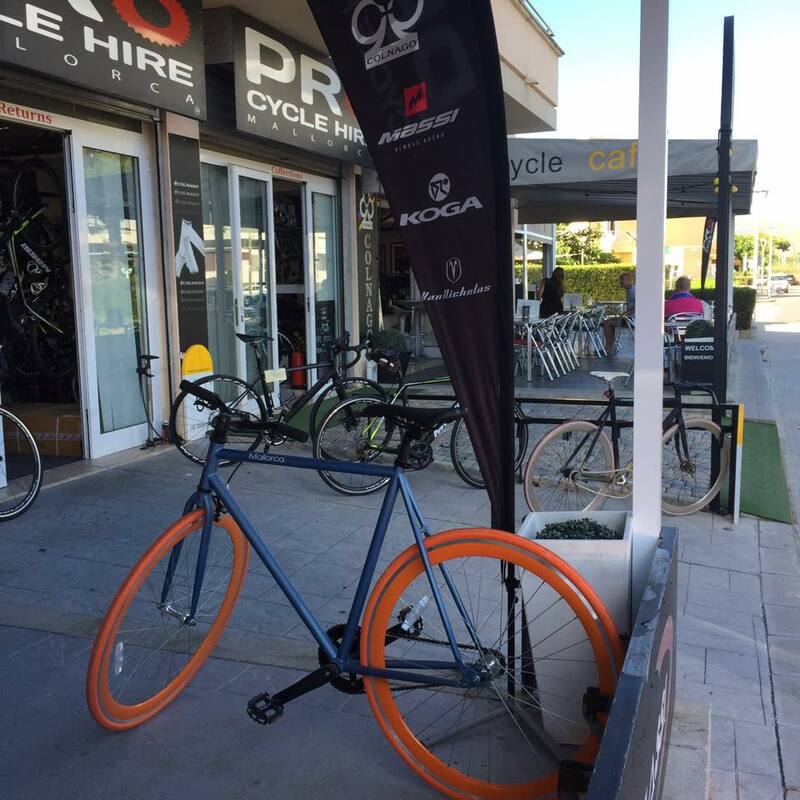 Located just behind the Pollensa Park Hotel Pro Cycle Hire are British owned. Order your bike on their website with your size requirements and its ready to ride when you collect it, just add your own pedals. There are several other bike hire options in Pollensa and a range of prices, but one of the advantages of PCH is that the bikes are set up the British way IE front brake on the right. This is a big plus as there is nothing worse than grabbing a handful of the wrong brake on a mountain descent - I have done it myself in the past and had a couple of big moments as a result. On our first day we did the popular ride to the lighthouse on the Formentor peninsula. It's a ride that is just under two hours and only about 25 miles but with a a lot of twists and turns and 2,700' of climbing. It's a must do ride with absolutely stunning views around every corner. 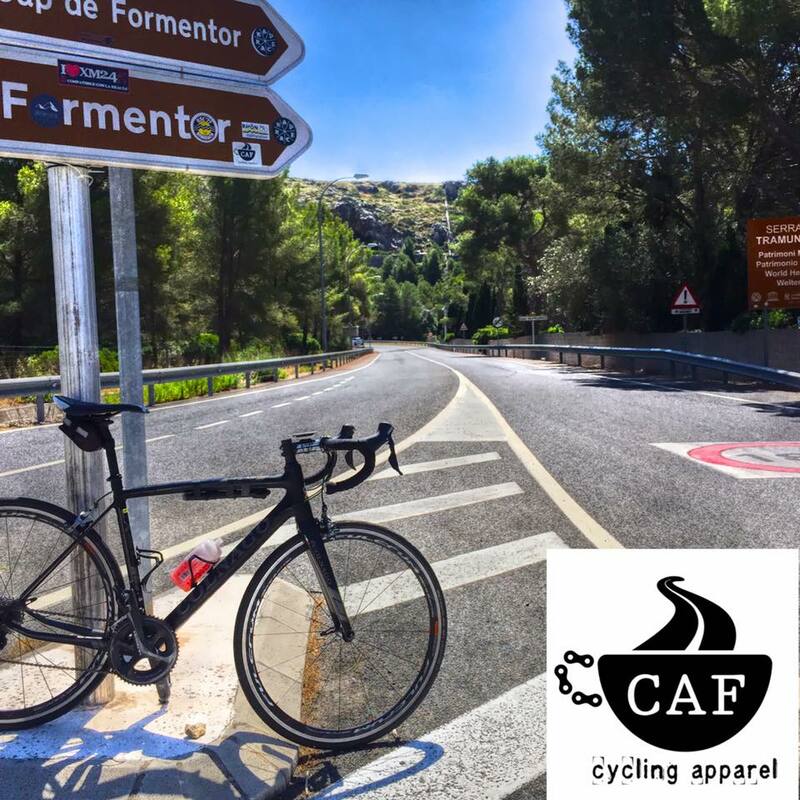 The above picture is the bottom of the first climb with a sticker from my friends at Caf Cycling Apparel CAF in the bottom right hand corner of the Formentor sign - look out for it and send them a selfie if you ever ride in Pollensa. 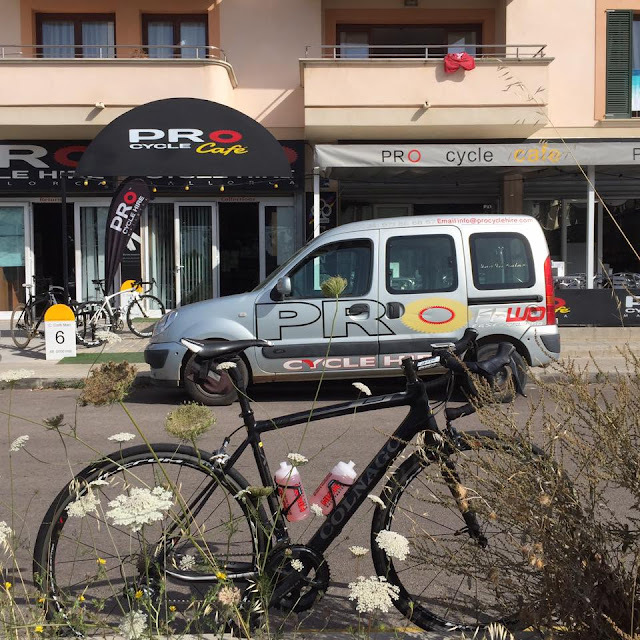 If you are in Pollensa and looking for a group ride Pro Cycle Hire organise two rides every week all year round. 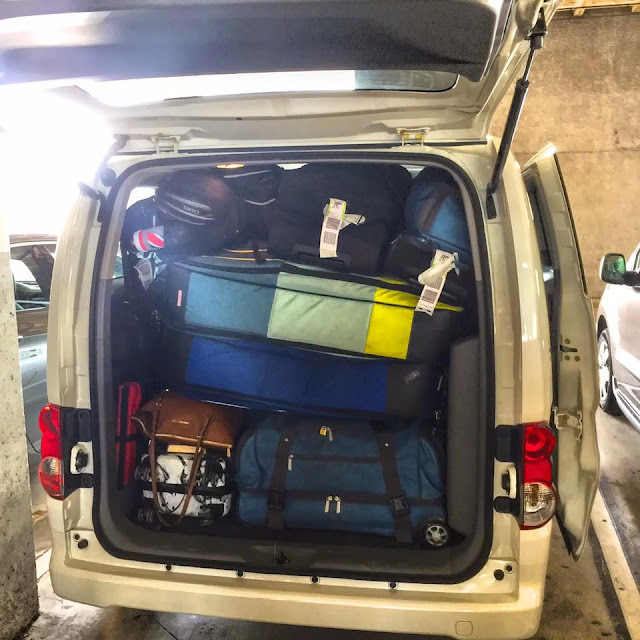 These rides are open to anyone not just PCH clients. 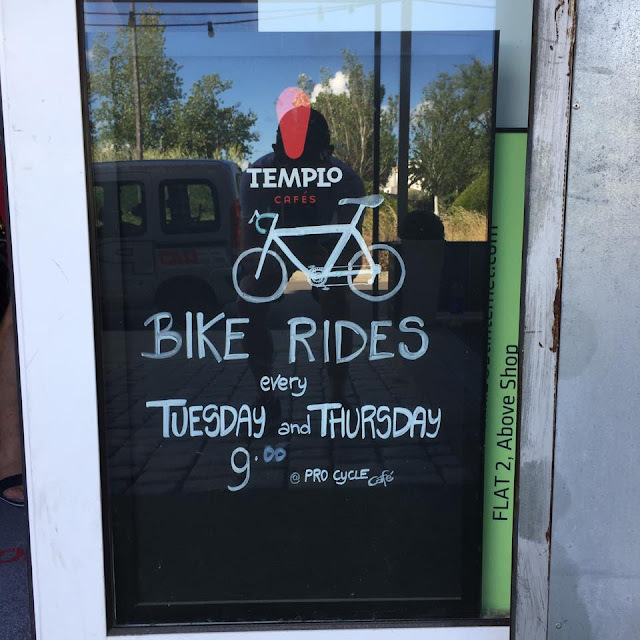 Get there for 9.00 but the rides usually roll out between 9.20 and 9.30. There is always a good mix of riders, a few expat British residents of Puerto Pollensa, a few people on holiday and a few locals. The rides are usually between 40 and 50 miles on rolling roads with a cafe stop at some point, Bruce the owner of PCH often leads these rides. There is also a Saturday ride which is a bit faster (and a bit more competitive) if you fancy testing your legs against some of the local racing boys. There is cafe attached to Pro Cycle Hire for after ride refreshments (beer!) 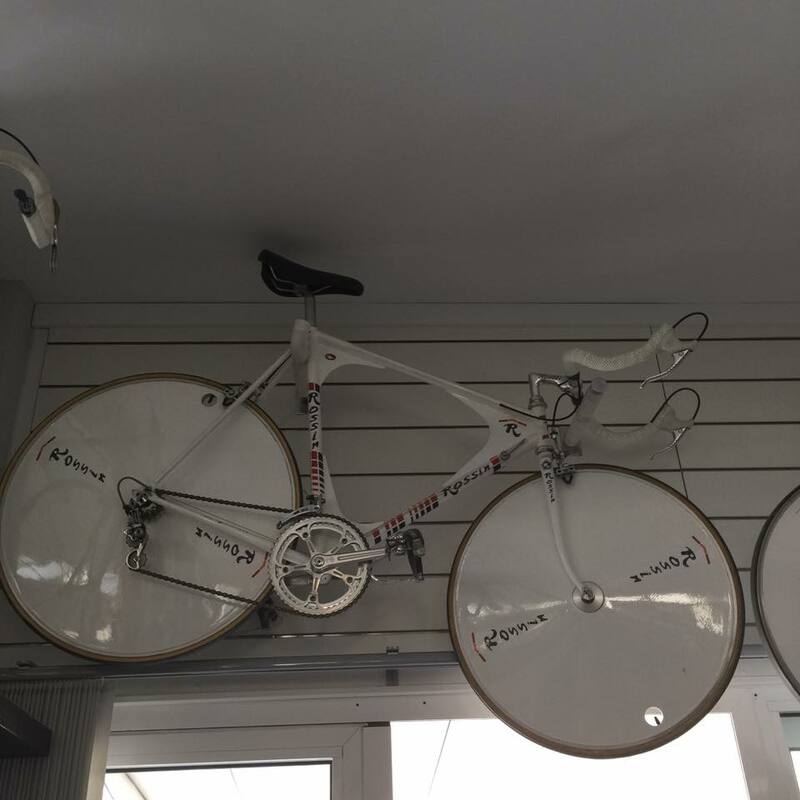 and it is worth having a mooch around the shop to check out Bruce's bike collection. 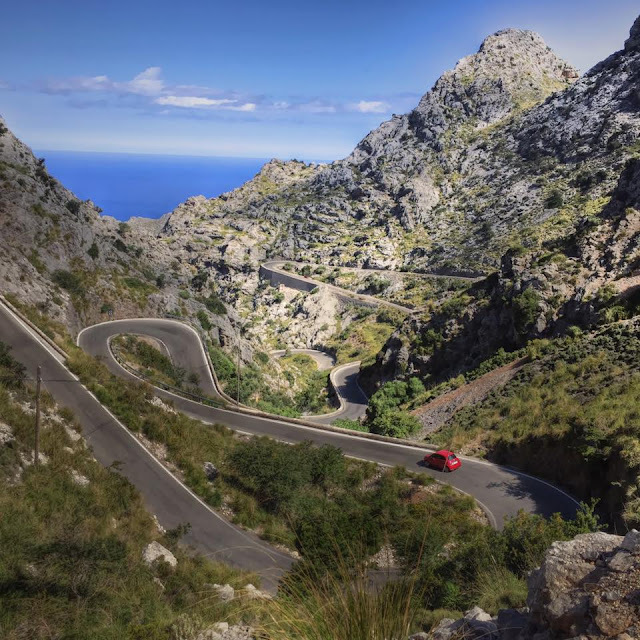 Above - Sa Calobra one of Majorca's most iconic climbs and an incredible bit of road building. From Pollensa it's a 60 mile 4 hour ride with over 6,000 feet of climbing. The first climb of the day is the Col de Femenia passing the monastery at Lluc (the monastery is a UNESCO World Heritage site - well worth a visit Lluc.). Turn right at the junction at the top in the direction of Soller, following a rolling section the next climb is the Col de Reis (quite tough) before you descend down to the tiny resort of Sa Calobra. When you get to the bottom you just turn around and ride back up - simples. Always best to do this ride fairly early as by late morning tourist coaches are going down to the resort and things can get a bit tight on the hairpins. My time from top to bottom and back to the top was 1hr.21min 46 sec a bit slower than my best ever effort of 1.15.53. To put that in perspective Alex Dowsett has done the descent and climb in 44 min 19 secs (and he is only in 8th place on the Strava leaderboard) bit of work to do on my my climbing then ! It was a holiday not a training camp but I still had my work cut out trying to live with these two, above my son Jack the Boss at Brother/NRG/Driver Plan and Hannah Farran of the Edco Continental Racing Team waiting for me at the top of the Coll de Reis before we descend to Sa Calobra. I managed to hold their wheels on the flat, just about managed on the descents - no chance on the climbs - I just watched them ride away every time. Majorca was my first opportunity to wear this new custom raceforthecafe.com kit from Nottingham based Godfrey Bikewear. Godfrey. 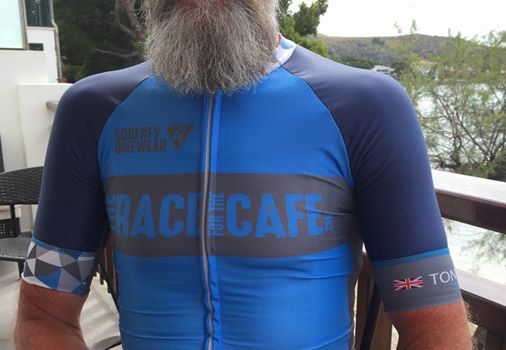 I was really happy with the quality of the race fit jersey and the guys at Godfrey have also added my name on the sleeve which is a nice touch. Another good option from Pollensa is to take the road to Campanet and from there to Selva where you can climb in to the mountains via the Coll de Sa Bataia, probably my favourite climb on the island. A series of hairpin turns at the bottom a short flatish section in the middle followed by another series of hairpins to the top. Approximately 5 miles of climbing with an average gradient of 5%. The view towards the coast from the flatter middle section of the Coll de Sa Bataia. At the top of the climb is the Coll de Sa Bataia restaurant and petrol station, a very popular stopping point for the many cyclists on the island. 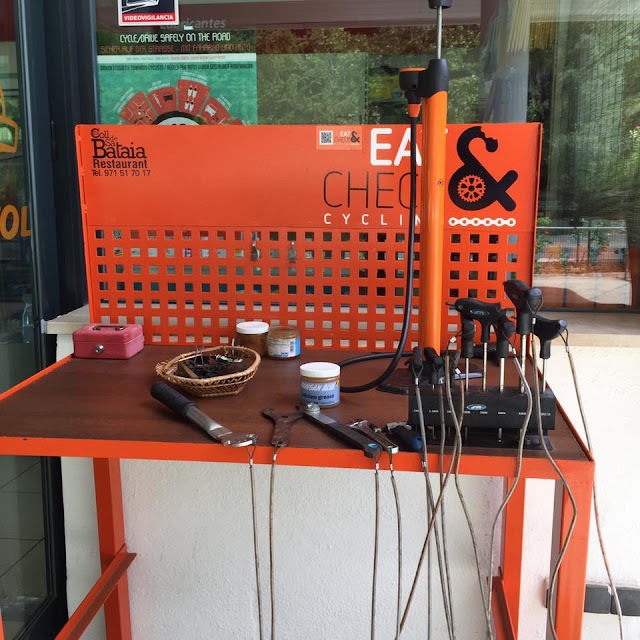 An indication here of how much cyclists are valued in Majorca, a fully equipped cycle work station including a bike stand on the petrol station forecourt. After a stop for a drink and to cool down after the climb the route takes you back to Pollensa by descending the Coll de Femenia. I am not a massive fan of fast descending if I am honest, but even I enjoy this one, 5 miles at an average gradient of 5% with a series of sweeping bends and a few tighter hairpins, a fantastic descent that puts a smile on my face every time I do it - I highly recomend this one. I finished the week with six rides: 13.5 hrs, 225 miles with 16,000ft of climbing - enough for me, it was a holiday after all.